Metrolife is a Responsive, Minimal, Creative and Professional Website Template for any type of Corporate, Business, Magazine, Creative, Portfolio, E-Commerce, Construction, Medical, Real Estate Websites. This Template Build with Bootstrap v3.3.6 Version and compatible with any type of Device. We have Developed Metrolife as a Pixel Perfect Template. We always provide quality Template for our Customer. TopClass and MAMA WordPress Themes are Example of Clean and Unique work of us. Just check our previous work. Our Dedicated Support team will help you to fix your any problem. 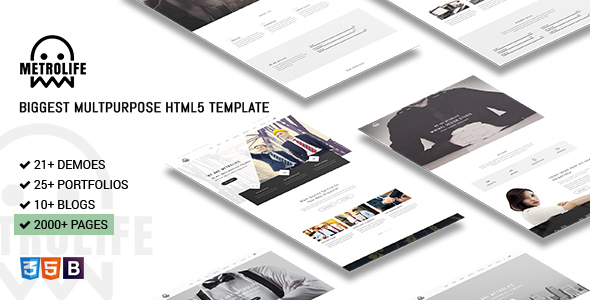 Metrolife – Responsive Multipurpose HTML5 Template provides 2000+ pages, 21 Unique Home Variations with 14 blog and 10+ Portfolio pages. There are 21+ Demos available now. Metrolife has 14 Headers and 9 Footer Styles, Choose the best for your Website. Font Awesome Icons and some essential jQuery Plugin include this template for super awesomeness features to keep you busy & satisfied. Click here to Subscribe our E-mail Newsletter & receive updates on Blog Updates, WordPress Themes, WordPress Pugins, giveaways and other news.